* Ball & club for illustrative purposes only & not included. PuttPlate® allows you to work on the most important elements of the stroke through impact in the most natural way possible. And as both the ball and club sit on the putting surface, PuttPlate® provides a truly realistic feel to your practice. Through it’s ball slot, straight edge & markings, PuttPlate’s central strikebridge ensures correct positioning of the ball and club face alignment/positioning at setup. Perfect vertically centred contact on the face is also given by avoiding the strikebridge as the putter moves through impact. 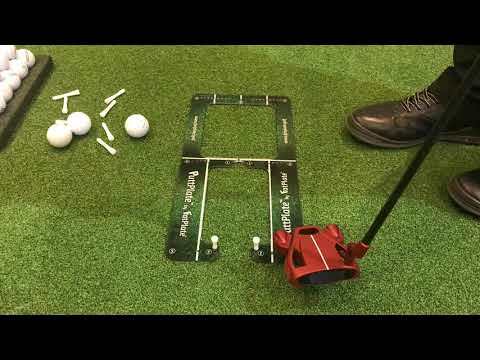 The tees can be positioned to allow for any type of stroke and the variety of drills means that you can work on just one specific aspect of your technique or really test yourself with all of it at the same time! PuttPlate® is supplied with standard tee pegs for outdoor practice and also our own specially manufactured flat-bottomed stub-tees that allow you to practice at home on any surface! To quantify your practice and establish where the weaknesses (if you have any) in your putting stroke lie we provide a 24 page practice record free of charge with every PuttPlate®. This record allows you to take a look back over 10 weeks or sessions to compare your scores to see how & where you’ve made improvements (and to establish areas that may need a little more work!). PuttPlate® is used by & is suitable for tour pros, teaching pros and recreational golfers of all abilities. Here Ben Frost tells you about the importance of centred contact. Here Ben Frost shows you how to establish your swing path. Here Ben Frost shows you a drill to help if you’re pushing your putts due to an in-to-out path. Here Ben Frost shows you a drill to help if you’re pulling your putts due to an out-to-in path. Here Ben Frost shows you how restricting your thru-stoke can help curb over acceleration. Here Ben Frost shows you how restricting your back swings may help with your short putts. Visit our Instruction & Training page if you’re interested in expert one-to-one or group tuition from PGA professional Ben Frost or, alternatively, from a PGA professional in the FatPlate Performance Studio at The National PGA Academy at The Belfry. If you have used worked-through 10 weeks or sessions using the 24 page practice record supplied free with PuttPlate™ and want to continue to Practice Smarter™, then this 150 page handy scorecard sized practice record will allow you to continue to record your practice results throughout the season. If you’ve lost the specially manufactured flat-bottomed stub-tees that are supplied with PuttPlate™ then don’t worry as you can buy replacements here. This pack of 24 consists of 12 x 53mm (club path gate) & 12 x 23mm (start line gate) stub-tees. Whilst PuttPlate allows you to use any standard wooden tee, if you’d rather use our premium printed 54mm wooden tees for your outdoor practice then you can purchase them here. Add feedback to your practice by placing MirrorBar on the putting surface in specific positions, and, at the appropriate angle. MirrorBar helps with many aspects of body & club alignment during setup and also helps to monitor and reduce any excessive or unwanted body movement during the actual putting stroke. 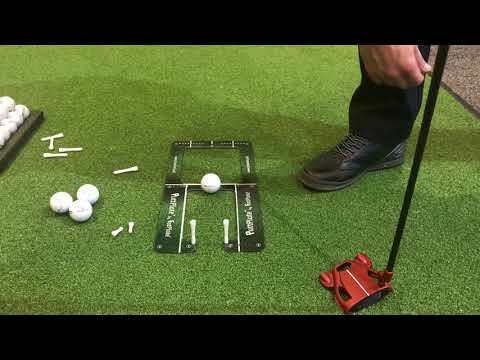 This video series gives you a quick run through of some of PuttPlate’s most popular pre-deﬁned, standard drills. 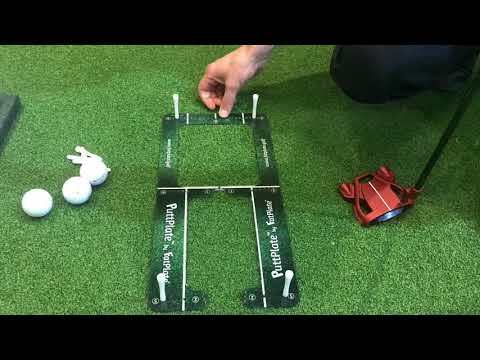 The PuttPlate has more sources of feedback than any aid I've previously used for coaching. You can work on just one specific aspect of your technique or really test yourself with all of them at the same time! Quite simply, I love PuttPlate because it helps me with my stroke. 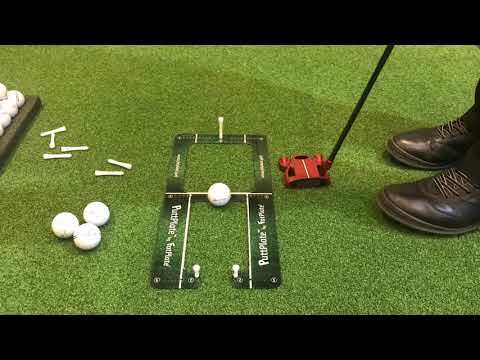 "PuttPlate is most versatile putting device I’ve used. 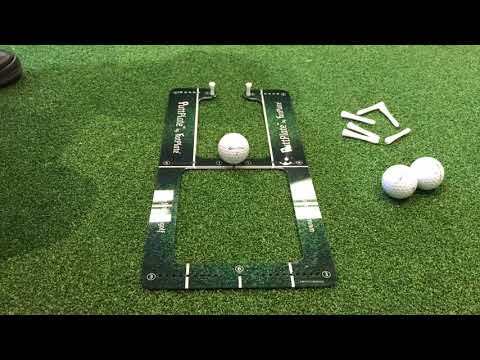 The tees can be positioned to allow for any type of stroke and for all of the drills, they can be positioned from wide to tight as your skill increases." PuttPlate, Mirror Insert & MirrorBar tick every box that I need from a putting aid: ball position, shoulder alignment, take away line, strikeand start line, giving me the 5 fundamentals of hitting perfect putts. Used by many of the world’s most respected golf coaches at/and elite golf centres. Ball and club both sit on the putting surface, giving you what we believe to be the most realistic feel to practice available. Work on impact, start line, back swing & thru-swing… or any combination of them all. Stub-Tees provided make PuttPlate® suitable for use on a natural putting surface, synthetic turf putting mat or carpet practice or even at home on your carpet! The tees can be positioned to allow for any type of stroke and/or difficultly level required. They can also be positioned to suit the size of your specific putter. Strikebridge ensures correct positioning of the ball and club face alignment at setup. Grass effect surface pattern has been designed to be sympathetic the natural putting environment. White markings offer effective contrast and help with alignment & setup. Supplied with 24 page practice record. Used by tour professionals and elite putting coaches. Provides a truly realistic feel to your practice. Designed to fit into a standard size golf bag. Made from sturdy, but flexible toughened acrylic. Can I use PuttPlate in any weather? Yes, PuttPlate can be used in all climatic situations but when not in use store flat indoors in order to continually provide best device function & product longevity. Will I be able to use my own tee pegs if I lose the ones supplied? 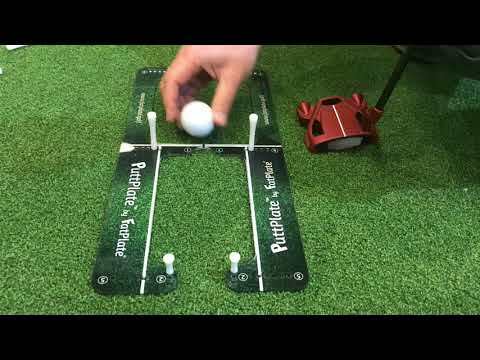 Yes, PuttPlate has been designed to be used with standard tee pegs when used outdoors on a putting green. And if you misplace the special indoor Stub-tees that we supply then you can buy replacements from this website. 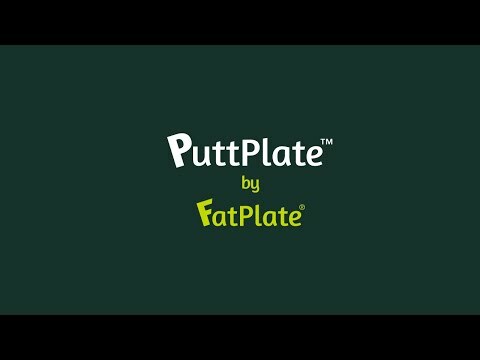 Can I stock PuttPlate in my golf shop? My PuttPlate has become slightly misshapen (a very slight arc), what can I do to fix this? When using PuttPlate on a putting green, position the standard tee pegs supplied to pin in position as required. Can PuttPlate be used by left handed players? Yes, simply rotate the PuttPlate through 180 degrees. 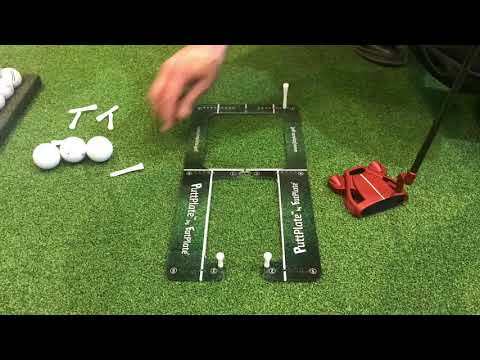 Can PuttPlate be used for (long & short) distance putting practice? Whilst PuttPlate has been principally designed for stroke and impact, it can most certainly be incorporated into many pace control drills. In fact, drill 11 has been provided specifically to work on limiting backswing length (to allow you to work on putts up 4 feet. What are the miss tolerances of the start line tees? Why can’t I call to discuss my delivery query? A growing number of tour professionals are now using FatPlates as part of their tournament practice routines whilst PGA teaching professionals are using them as part of their daily lessons to ensure that competitive amateurs worldwide continue to Practice Smarter™.